Prepare to spend at least a couple of days here so you have time to take in the city and its surroundings. 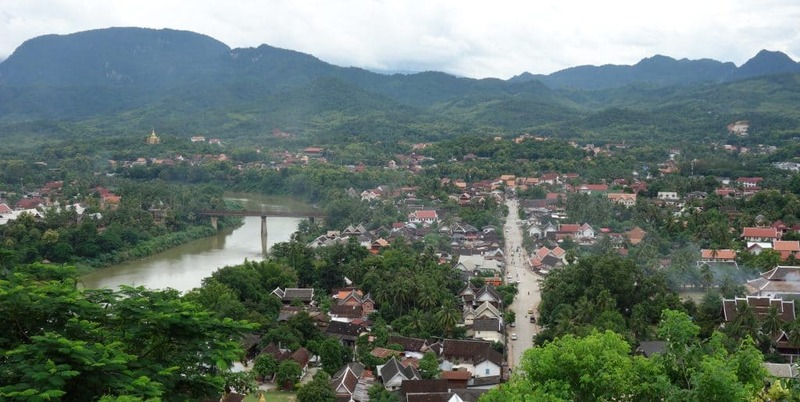 Located in the middle of Luang Prabang, this hill is perfect if you want to get an overview of the city. The steps are steep but that makes the view from the top even more rewarding. Phou Si is a popular sunset spot and will get crowded in the evening, but it is worth visiting at any time of the day. There are a couple of staircases leading up and down the hill so don’t come back the same way you used for going up. Choose a different path and you will see temple buildings and religious statues. Located about 35 kilometers away from Luang Prabang, Kuang Si waterfall is easily one of the city’s highlights. Water cascades down the waterfall and then flows through natural pools. The light turquoise water and the surrounding jungle make it a perfect spot for going for a swim. Don’t rush your visit here. A path takes you up to the top of the waterfall and while it is slippery, it is worth the effort. Up there, you will find more pools to swim in. 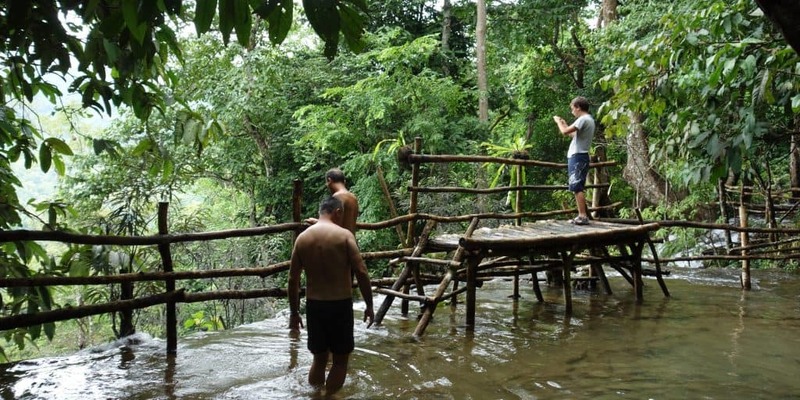 You can climb a bridge to see the waterfall cascade down into the jungle or you can swing just above the water. And if you’re up to it, you can also rent a boat that takes you to the source of the waterfall. 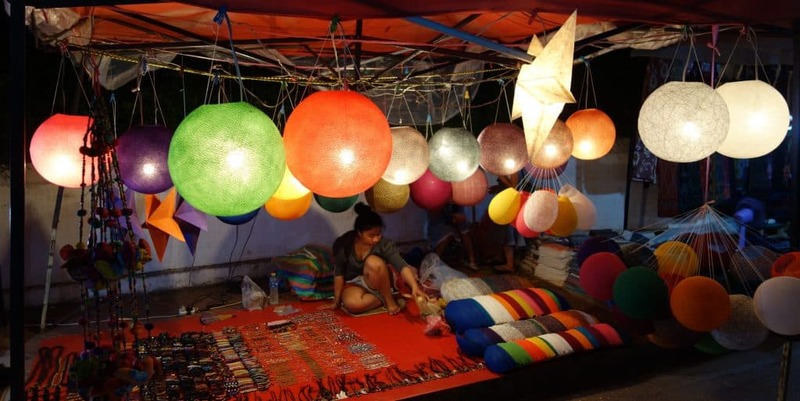 Night markets are always worth visiting, but the one in Luang Prabang is particularly good. If you’re planning on buying souvenirs, this is where you want to go. The market sprawls out over hundreds of meters and several rows of stalls so you can be sure to find something you like. If you’re hungry, this is also where you can get some good and cheap street food. 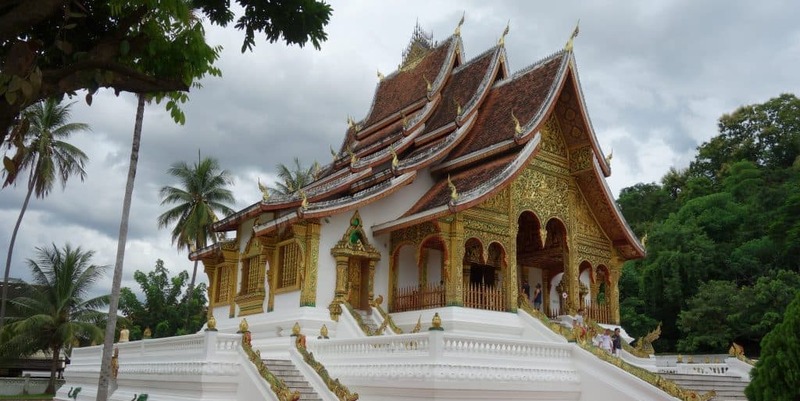 Wat Xienthong, located almost at the tip of the peninsula that makes up the city centre of Luang Prabang, is the city’s most famous temple. 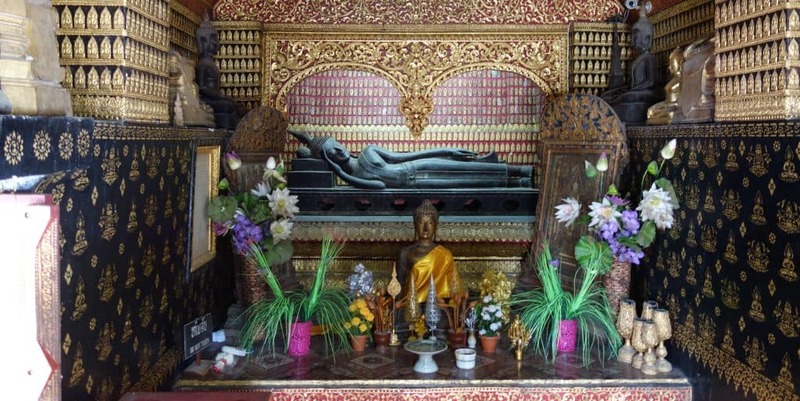 Decorated with green and gold, it is a great example of typical Laos temple architecture. The temple grounds consist of two main buildings and several small ones that are worth seeing. Just make sure you dress appropriately when coming here. Cooking classes are a great way to learn about local food and ingredients. We did a cooking class with Tamarind Restaurant, which I can highly recommend. First, we went to a local market to learn about local ingredients and herbs I had never seen before. Then, we continued on to their beautiful outdoor kitchen, where we prepared six dishes: Jeow, a spicy dipping sauce, fish wrapped in banana leaves, sticky rice, larb, a minced meat salad, lemongrass stuffed with chicken (no, not chicken stuffed with lemongrass but the other way around) and coconut sticky rice with fruit for desert. Once we were done, we ate our creations for lunch and got a book so we can recreate the dishes at home. 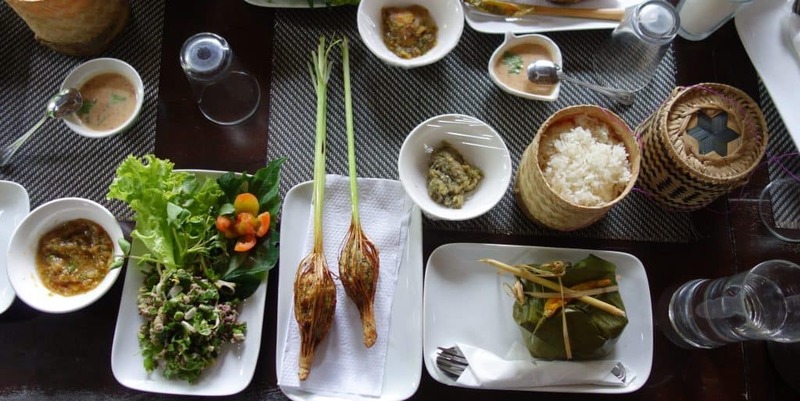 I’m already looking forward to cooking Laos food for friends and family! The Palace museum is an interesting place. One of the highlights is the beautiful temple located near the entrance. Once you’ve had a proper look at it, you can continue to see the palace and its interior. Make sure to lock your bag in the lockers and take your entrance ticket with you. Forget about it and you will keep running back and forth between the palace and the lockers. The inside of the palace is unlike anything I’ve ever seen in a royal residence. But you should go and take a look yourself. When I came to Luang Prabang in 2011, I got up before sunrise to watch the alms-giving ceremony. It was magical. 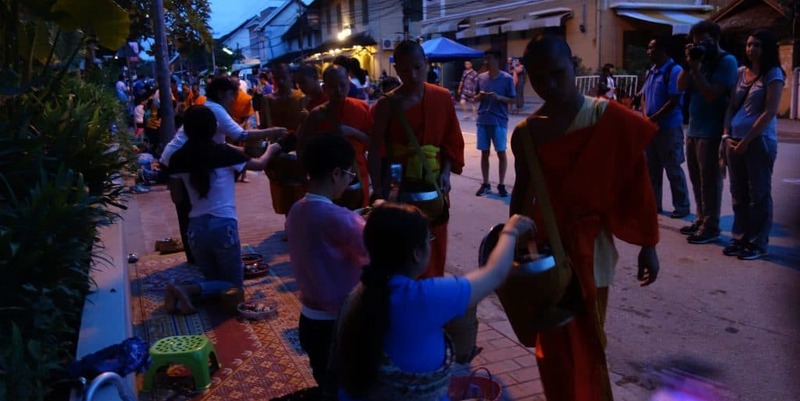 In the light of early dawn, monks walked along the street, receiving food from the locals. Everything was quiet, even the few tourists who watched did not say a word. The ceremony was different when I returned a couple of weeks ago. Only a handful of monks walked along the streets. Hordes of tourists jumped into their faces to take pictures. The whole thing was over in a minute. Maybe I was unlucky. Other tourists I talked to, who went on different days, had a very different experience. I recommend you take a look yourself, but please be respectful and remember that this is a religious ceremony. If you leave Luang Prabang by boat, chances are that you’re going to stop here. If not, consider visiting this cave as a half-day trip. Only accessible by boat, the caves are located high in the limestone cliffs along the Mekong river. Steps will take you there. The caves are not impressive because of the quality of the Buddha statues inside but because of the amount of them. Some are larger, many are tiny, and there’s definitely too many to count. So there you have it, some of Luang Prabang’s highlights. If you have any other suggestions, I would love to hear about them.